Bullish Article on Certified Collectibles Goes Viral! Last week, a major article on certified collectibles took social media by storm and went viral through the collectibles industry. The article reports that our nation’s skyrocketing debt has led to a distrust of our nations currency and the future value of it. The article says this distrust is encouraging people to turn to tangible assets that can be held in your hand and where the value can be easily understood. There are 3 pictures in the article, 2 of a comic book and one of a baseball card, all of which have been independently graded and authenticated by a third party service. The 2 comic book photos were of a CGC graded comic, the very same service that is now revolutionizing the market for Vintage Concert Posters. When you read in this article about $3 million comic books and $17 million Ferrari’s, it’s easy to understand why experienced collectors are now entering our marketplace and snapping up the most desirable material they can find, as fast as they can. It is not lost on the people we deal with that these posters were created in ridiculously low numbers, the vast majority have been thoroughly damaged, and the historical importance of this material is unsurpassed. All of sudden, this year has sped by and the New Year is staring us right in the face. 2017 will be highlighted by the 50th Anniversary of the Summer of Love, and the focus and interest on the posters of this era will enjoy monumental attention. Our advice is to fill the holes in your collection now, while the material is available and can still be acquired for 5-10 cents of what comparable collectibles trade for. If you are looking to sell posters, this is an excellent time, as demand far exceeds the available supply of top material. Please contact us to review how you can get immediate top prices for your holdings. We will buy your entire collection, we don’t pick and choose. Whether buying or selling Vintage Concert posters, we look for to helping you achieve your goals! To read the article on the collectibles market, click here! Obviously, the city of San Francisco is the ideal backdrop for the poster show as it was the original production/distribution point for the majority of these posters. To this day the city still carries the magical qualities that allowed the 1960’s music scene to flourish. The innovators of San Francisco poster art were on hand to sign their masterpieces for hungry fans. Wes Wilson, Mouse, Moscoso, David Singer Mari Tepper, David Byrd, Lee Conklin, Randy Tuten joyfully signing and sharing memories from the day. The modern poster artists get a lot of attention at the TRPS show as well. Their passionate fans line up for hours to get copies of limited editions and rare variants from their favorite artists. The works of the of EMEK, Chuck Sperry, Marc Spusta, Matt Leunig (to name just a few)were on display and selling briskly. It was an active day at the PAE table as well. We were delighted to get to meet with customers that we only know from the phone and email and put a face with them. It was great to get feedback from folks we work with all year long. Everyone was gracious and loved the information that we put out in this forum. We also lined up several longtime collectors who will be selling their posters in our auction in the coming year. The energy in the room was palpable and the interest in the vintage posters is stronger than. The intensified interest in the third party graded material from CGC was a hot topic. All Said and done, the 2016 Festival of Rock posters was a terrific time, it’s great to meet with all of the people that make this incredible collectible a reality. 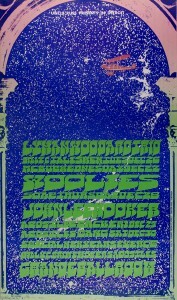 Yet Another Major Vintage 1960’s Concert Posters Feature! Right on the heels of the news about the “ You Say you Want a Revolution- Records and Rebels 1966-1970” exhibition at the Victoria and Albert Museum in London comes a major article and online gallery featuring vintage 1960’s concert posters by The Guardian newspaper. The collection was formed by the late Felix Dennis, a very successful and famous entrepreneur in Great Britain. Dennis is most widely known in the U.S. for his founding and ownership of Maxim magazine. In addition to expanding interest both in print, and online, the posters themselves were on display October 7 and 8 in a gallery in London. While this continued widespread exposure to these posters is very important, this story is important for two other reasons. First, anyone associated with this hobby will tell you that there is TREMENDOUS interest in these posters overseas. Icons such as Jimi Hendrix, Janis Joplin and the Doors are WORLDWIDE legends that transcend borders. This is one of the reasons these posters are more exciting than many collectibles that only enjoy collector appeal within the United States. Secondly, we can tell you that we have many famous and influential clients that are active collectors of this material. They understand the myriad of reasons why these posters are desirable and they clearly have the financial wherewithal to acquire the finest and most desirable pieces. What’s most exciting, is that unlike almost all other collectibles, the value of these posters have not yet grown out of reach of “the common man”. You can still acquire a museum quality poster with tremendous historical importance, that exists in tiny quantities for the same price charged for mass produced pieces of crap in every “Art Gallery” in America. You won’t find the artwork hanging in your friends house’s hanging in any museum, but your Vintage Concert posters are being featured and praised everywhere, all over the world! That was the quote from one of the world’s top collectibles experts and dealers with 40 plus years of experience that includes a stint as co-owner of a major rock and roll collectibles business. Why did he say this? Because he understood that Vintage Concert Posters have widespread appeal, are historically important and are far rarer and much cheaper than most other collectibles. He was impressed by the CGC third party authentication and grading and thought the packaging also made it far easier to handle and store the posters in perfect condition. “You guys are really ambitious being here! This was not said by one person, but by all the customers that came out to see us to both buy and sell. It’s always great to put a face with a name, review our inventory in person, buy posters that have been put away by our clients for decades, and share the many nuances and bits of information that we have to share with our clientele. In conclusion, we exhibited at this show with the goal of exposing these incredible artworks and third party grading to the thousands of people that are already buying, selling and trading certified collectibles on a daily basis. To be honest, we didn’t know quite what to expect at the start of the event. We were blown away by the outpouring of interest and support and it was wonderful to meet the people in person that we so often communicate with over the phone and through email. It was a tremendous success and something we will continue to do in the future! The CGC Rock Poster Revolution—Where We Are Now! As The CGC Rock Poster Revolution continues to unfold, it’s important to remember the BIG PICTURE of where this market was and where it’s going. 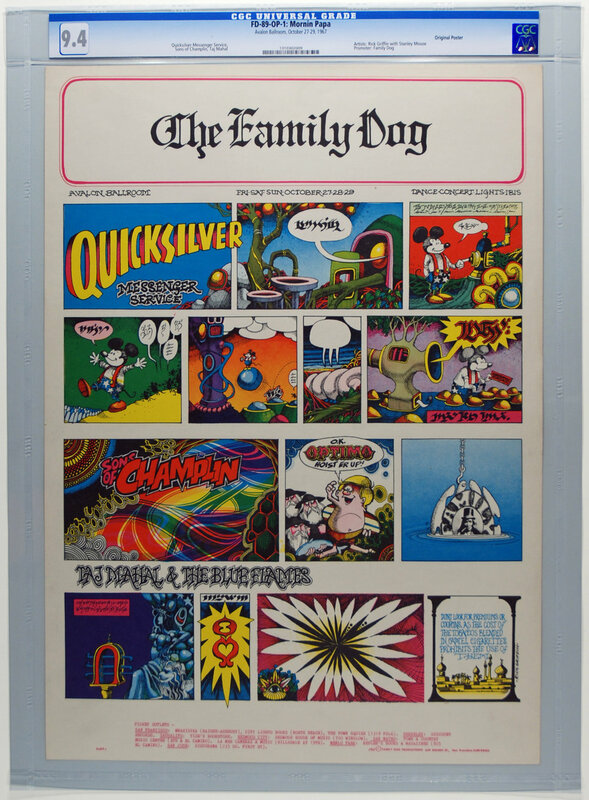 For many years, we implored our clientele to buy the highest quality posters they could, and to pay the small premium at the time (usually less than double a damaged copy) to acquire the best examples they could. This advice proved to be prescient and the collectors that acted on this recommendation are sitting pretty today. But the collectors that bought quality in the past were the equivalent to angel investors who bought stock in private companies with a hope and a prayer that they will someday go public. The purchase may pan out, and it may not. Today’s market is very different. CGC grading is now a reality. The future is far more clear cut and easier to understand. CGC grading of rock concert posters has now “gone public”, and buying today, at today’s price levels is like buying stock in a company when it first goes public. Please note the above examples are the smallest premiums seen for the most common of all coins. Most coins bring FAR HIGHER premiums as the grade ascends! And the examples above are for coins where tens of millions were made and many tens of thousands exist in MS60 or higher. Clearly, CGC graded posters offered today WILL NOT bring 15-30 times what a lesser graded, non CGC graded example would bring. And that represents an opportunity. Based on all other collectibles, we believe it WILL BE POSSIBLE to see similar premiums in the not too distant future. We believe the focus on top quality concert posters that began several years ago will continue and accelerate. You have this knowledge, the only question now is what you will do with it! Rare CGC Comic Book Brings $956,000! Rare CGC Comic Book Brings Record $956,000! Last week a 1938 Action Comics #1 comic book that was graded by CGC made national news headlines when it brought a staggering $956,000 at auction! It's the holy grail of comic collecting, and we've never auctioned a higher-graded, unrestored copy! In the nearly 15 years since our first auction, we've offered a total of 18 complete copies of the iconic issue, but only nine of those had earned the CGC blue Universal label awarded to an unrestored copy. The auctioneer clearly explains the importance that this comic book is CGC graded, UNRESTORED, and HIGH GRADE. Furthermore, this is a NUMBER ONE, and readers of this blog are very familiar of the ultra high desirability of a NUMBER ONE in collectibles. This is something we are true believers in and adhering to this collecting philosophy has personally made us many millions of dollars in the collectibles markets over the years. Lastly, the CNN story states that about 100 copies are known to exist in any condition! MANY of the poster we sell have around 100 known, and many much, much less. And these can be acquired for $150 and up!!! Please stop for a second and take a break from your very busy day. Stop all the noise in your head and just ponder all of this for a second. The CGC Rock Poster Revolution is unfolding right before your very eyes. We have told you that third party grading would lead to increased media attention, collector participation, rising demand, rising values and a great focus on condition and originality. We did not pull these ideas out of thin air, or make them up out of whole cloth. We are simply reporting the obvious, what has already happened in SIX OTHER COLLECTIBLES markets. As a reader of this blog, you should consider yourself lucky to be at the right place, at the right time. You are one of the relative few…for now. There will always be naysayers, but the market speaks louder than any individual. Listen closely to what’s happening now and ACT accordingly. As we have stated repeatedly, the great majority of posters we handle never make it into our store or auction. If you would like help in starting a collection, it’s up to you to contact us, we are here to help you any way we can. It has just been announced that the phenomenal “Bill Graham and The Rock and Roll Revolution” exhibit that has already appeared in Los Angeles and San Francisco, is now making its way east to Philadalphia! The exhibit will open 9/16/16 at The National Museum of American Jewish History in Philadelphia, Pa. and will run through 1/16/17. The exhibit features over 200 pieces of memorabilia that covers the entirety of Graham’s life and career. The vast majority of pieces in the exhibit are the very same concert posters that have become so sought after by collectors. 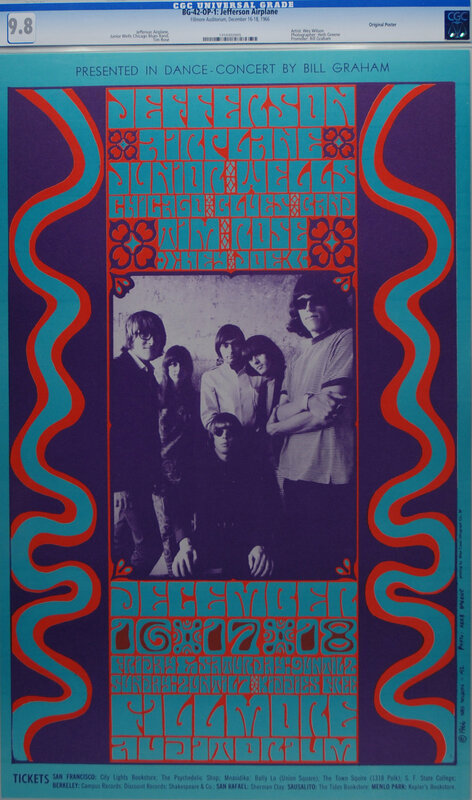 This news guarantees that a mega bright spotlight will continue to be focused on Vintage Rock Concert Posters in general, and Fillmore posters, in particular. More importantly, with each new museum retrospective, there is a heightened recognition and appreciation for both the historical significance and artistic merits of these artworks. 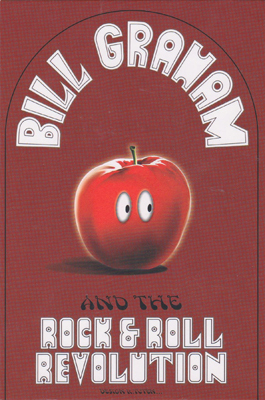 We continue to recommend collecting any and all issues pertaining to Bill Graham concerts. Our specific advice continues to be the same: Buy the best possible posters you can afford. Buy one great poster instead of five middle of the road pieces. Buy Original First Printings whenever possible. Focus on the highest quality and earliest examples you can find. Most importantly, understand and act on what you see happening here. Six or seven years ago, it would have been earth shattering news to hear about the appearance of Vintage Rock Concert posters in any major museum. Now, this is happening many times a year. No wonder demand for the best material is far out stripping the tiny available supply! What’s most exciting is that we believe we are just in the top of the second inning as far what you will eventually see develop in this exciting, emerging market. Stay tuned for a detailed report on the Philadelphia exhibit, as soon as it opens. SPECIAL REPORT ! CGC Graded Concert Posters are Exploding in Value! The Certified Guaranty Company (CGC) is the recognized leader in third party authentication and grading of collectibles. Three times since 1987, CGC has entered a collectibles market. First, rare coins in 1987 (NGC). Second, was rare comic books in 2000 (CGC). And then, rare paper money in 2005 (PMG). Each and every time - the value for the highest graded and finest quality examples of these collectibles exploded in value, 500%, 1000% and in thousands upon thousands of examples, much, much more! It is an absolute truth that CGC authentication and grading has added literally BILLIONS OF DOLLARS of market value to rare coins, comic books and paper money. Yes, that’s BILLIONS, with a “B”. Not millions, or tens of millions, or hundreds of millions. This is real money, BILLIONS OF DOLLARS, that dropped right into the pockets of smart collectors that had the knowledge, understanding and ability to act when the opportunity presented itself! Why has CGC authentication and grading resulted in billions of dollars of increased market value for these other collectibles? Impartial, third party authentication and grading of a collectible allows anyone to buy and participate in that market with total confidence, even if they are just getting started. Fear of counterfeits? GONE! Fear of undisclosed restoration? GONE! Fear of liquidity when selling? GONE! Most importantly, the elimination of all these fears, and their absence in the marketplace, is GUARANTEED by CGC. This increase in confidence leads to an EXPONENTIAL INCREASE IN DEMAND. The same thing is now just starting to happen in the marketplace for Vintage Concert posters. New players are entering the market. In many cases, these are the very same players that made a killing in these other collectibles. These smart collectors understand what they see unfolding right before their very eyes- AGAIN! But there are four major factors that are DIFFERENT this time. Four factors that lead us to believe the potential desirability and appreciation for Vintage Concert Posters dwarfs what happened when third party authentication and grading of other collectibles was introduced. 1) Vintage Concert Posters are many thousands of times rarer than coins, comic books and paper money! All three of those collectibles were mass produced in the hundreds of millions. The average concert poster was released in an edition of 500 – 3500, with most 1000 or less. 2) Vintage Concert Posters can be displayed in your home! Coins, comics and paper money are almost always stored in vaults or safe deposit boxes, reserved for the quiet, enjoyment of the collector. These spectacular posters can be enjoyed and displayed, making them so much more desirable, to so many more people. Make no mistake about it, that’s why the most valuable art trades in the hundreds of millions of dollars while the most valuable of these other collectibles trade for 1-2 million dollars! When people can proudly display what they have, they are willing to pay more for it. A LOT more! 3) Vintage Concert Posters can be seen in major museums! Over the past several years, these posters have received widespread recognition and exposure in major museums throughout the United States. This inherently makes these artworks more valuable and desirable. We have reported extensively upon this and is another major factor in explaining the price disparity of art and other collectibles. 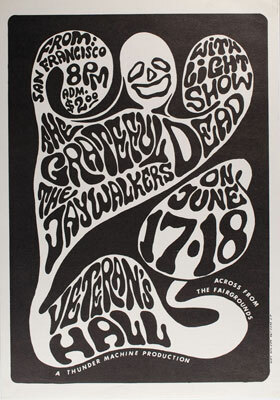 4) Vintage Concert Posters enjoy potential demand from tens of millions of fans of the musicians! Jimi Hendrix, Janis Joplin, The Grateful Dead, and all the other bands have scores of rabid fans that already connect with them and their music. The addressable market for these posters in exponentially higher than for any other collectible, including the Van Gogh’s and Warhol’s that are worth more than the finest homes or yachts. It will be interesting to watch what happens when these fans learn that they can now buy Vintage Concert Posters from the era with complete and total confidence! And lastly, unlike the market for U.S. coins and paper money, these fans form an international base of demand. People know who Hendrix is, regardless of what language they speak, because music is the universal language! In short, the announcement that CGC is now authenticating and grading Vintage Concert Posters has provided collectors with a brand new, ground floor, collectibles opportunity. An opportunity that YOU are now among the first to discover. The only question that remains is what YOU are going to do with this information! It’s a well chronicled fact that for the past 7 years we have been advising our clientele to focus on condition and to acquire the best quality examples you can locate and afford. We are proud that many of our clients that listened to our advice are now sitting on collections that in many cases cannot be replicated today – AT ANY PRICE! It is also a matter of fact that we never have - and never will - advise collectors to “invest” in posters with a profit motive in mind. We are simply stating that if you have “the collecting gene”, this is an opportunity to acquire a world class collectible, with world class rarity and desirability, at prices that are ridiculously cheap compared to most other collectibles. And if you have that “gene”, having a highly valuable, World Class Collection of anything is a worthy goal. We also think this opportunity won’t last very long! Please know that we stand ready to assist you and answer any questions you may have. Also, please know that the VAST majority of posters we handle never make it into our store or auction. So let us know what you are looking for, or contact us if you want advice on what issues you should target and/or are available. Also, if you have posters for sale, we will be your top cash buyer, with immediate payment within 24 hours. We hope to hear from you soon! Any seasoned collector will tell you that one of the main keys to success is specialization. Why? The answer is really pretty simple. Specialization allows you to tilt the odds for collecting success in your favor by allowing you to gain knowledge and expertise that exceeds what is generally known on a topic. And just like everything else in life, knowledge and expertise = power and success. For example, specialization will allow you to know about specific issues that are rarer or more common than generally believed, you’ll meet and know the other sophisticated players in your specialty, and you’ll be able to identify mis-priced opportunities both at auction and in dealer inventories. Also, once you are known in the collecting community for a specific specialty, you will be the first to be offered opportunities and deals that pertain to your area of expertise. These are just a tiny fraction of the advantages of specialization that immediately come to mind. Specialize in posters by a particular poster artist, specialize in the posters of a particular band, specialize in the posters of a specific venue, specialize in the posters of a particular band, or posters from a specific year. These are just a few ideas, the area you decide to specialize in should be personal to you and your individual tastes and interests. Another HUGE advantage of adhering to this strategy is that it specialization guarantees that you will end up with a collection that will be focused, highly interesting and significant. Instead of owning a random hodge podge of posters, you can display your collection with pride as “a complete collection of concert posters from the Straight Theater”, for example. If you’ve read this far, I hope you’ll take a moment to reflect on this advice and seriously consider it. It is some of the best advice I can give you from 43 years as a collector. It has served me well and I’m sure it will be valuable for you, too. 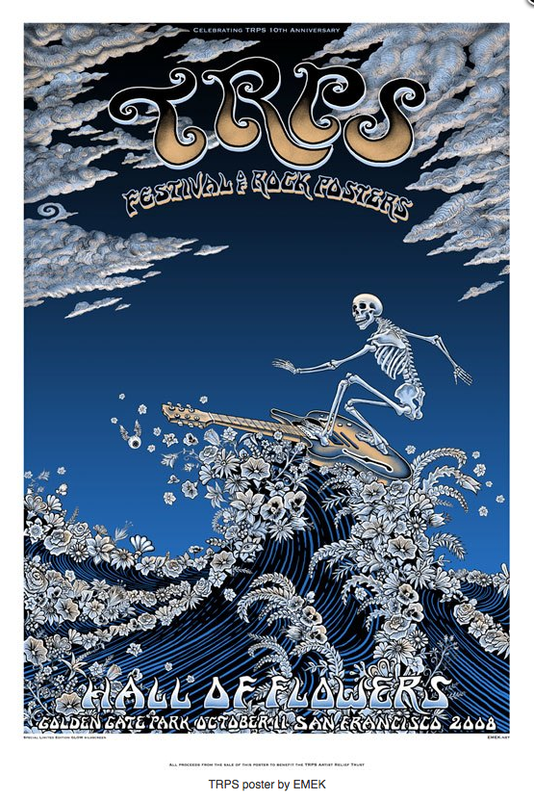 Through careful research and a collaborative effort from within the Concert Poster Community, we can conclusively announce the discovery of a stash of forged copies of this extremely rare and highly sought after Grateful Dead poster. All collectors should proceed with extreme caution when contemplating the acquisition of this rare issue and receive iron clad Guarantees of Authenticity from any seller. 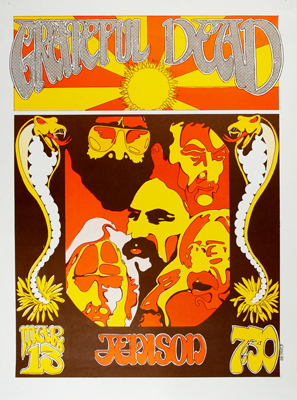 In January, 2014, PAE was privileged to auction the first known example of a poster advertising the Grateful Dead at Jenison Field House, in East Lansing Michigan, on the campus of Michigan State University. The concert was held on March 13, 1971 and the artist was Hugh Surratt. Shortly after our sale, this poster began frequently appearing in auctions and dealer inventories throughout the nation. Curiously, each example that surfaces exhibited the exact same wear, water damage, pinholes and discoloration. Here are the definitive measurements of authentic copies. There are currently two copies known, one that came from the artist and another still retained by the artist. The easiest way to detect bootleg copies is by the telltale aging that was executed by the counterfeiter. The bootleg copies are is printed on heavy paper and have been artificially aged yellow on the front and is white on the back. The fake copies also exhibit moisture ripples and staple holes. The overall dimensions of the counterfeit copies are 17 3/16 x 23 9/16”. The upper rectangular image of the Sun and Grateful Dead legend measures 5 7/16” x 15 ¼”. The lower rectangular image showing a portrait of the band measures 14 15/16” x 15 ¼” . The top border of the fake poster is 1 3/8” the bottom border is 1 7/16”. The left border of counterfeit copies measures 1 1/16” the right border equals 1 ½”. All of the bootleg copies can be traced back to a Craig’s List seller in Wisconsin by the name of Mike.